The cold is lifting around Australia, the rain is subsiding, the grey skies are clearing and with our calendars well into the later months, it’s officially spring! With spring comes blossoms, blue skies and perfect weather for a day out in the park. But it also comes with Footy Finals and Spring Racing. And, all these things mean BBQs and outdoor entertaining! We’re pretty keen to get BBQ season underway; we’ve been checking out trends from around the world for the last three months and can’t wait to give them a go in our own backyards, when we host our first BBQ of the season! 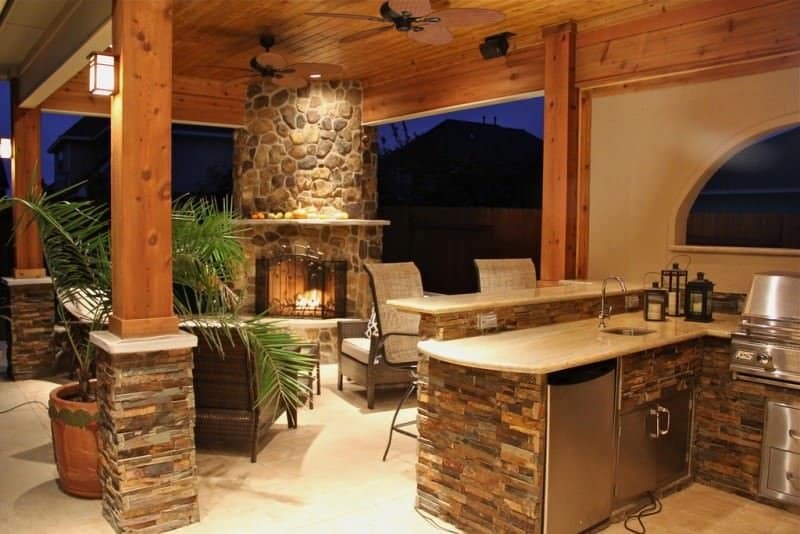 No longer will we be slaves to the kitchen and miss out on all the fun when entertaining this spring; an outdoor kitchen is one of the most popular installations on backyard verandas throughout the country. If you’re giving your backyard a big makeover this spring, installing a fully functional outdoor kitchen is a pricey but worthy endeavour, with bench space, oven and grill, fridge and running water meaning you won’t have to run inside for anything. But if you’re looking for a fun, more original, and cheaper way to bring the cooking outside, a free standing pizza oven will cost you less than $300 and will be an investment your guests and family will love for years to come. Whether you make your own dough, or go with a simple pita-bread base, allow your guests to create their own Italian masterpieces with their favourite toppings. The best part about an outdoor pizza oven is that there’s less cooking for you, and everyone gets to enjoy their meal just the way they like! Photo credit: Darin Chamberlin via Flickr. Bring a new mood to your backyard with outdoor lighting. Fairy lights are a simple yet stylish addition to your backyard. Hang them from your fence or string them around the beams in your veranda and watch your space transform into a dreamy outdoor oasis. Add lanterns for some extra style and a pop of colour. But please, make sure you buy outdoor lights! If you’re looking for a more sustainable option, solar-powered garden lamps are the way to go. Just pop them into the ground throughout your garden beds, or line them up along the edge of your veranda or pergola to create an intimate space. Most department or garden stores will sell a set of these little beauties with money to spare from a $50, and they’ll cost you nothing to run once they’re in the ground. Photo credit: Texas Custom Patios via Flickr. The fresh-eating trend is on the rise! With more and more people looking to eat cleaner and more sustainably, the veggie patch is experiencing a popular re-emergence in the Aussie backyard. A veggie patch means that everything you grow and serve will be fresh and organic. If you don’t have the space (or time!) to maintain a whole veggie patch, even a small herb garden will be the perfect addition to your garden. Need to add a sprig of parsley to your salad? Enjoy your ultimate bragging rights by ducking to your garden and returning with a freshly cut handful of organic herbs. Technology is undoubtedly the cornerstone of our society these days, and Australians love to be up-to-date and in-the-know. If you’re planning on hosting a Cup Day BBQ, then you’ll need to have your technology up to scratch to keep everyone out of your lounge room, off their phones and lapping up the spring sun in your backyard. 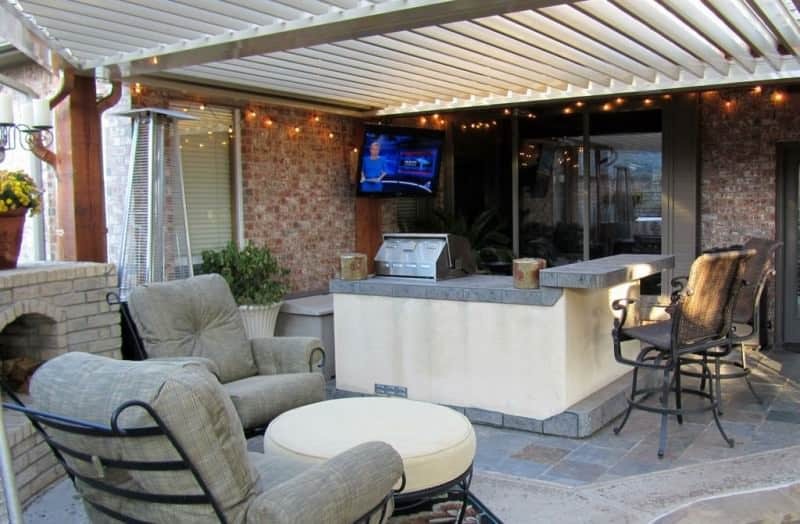 Outdoor TVs enclosures (like this one) and sound systems are one of the latest trends to be popping up in backyards throughout Australia and the world. It may be a bit pricey, but installing a specially-designed flat screen TV on your veranda or patio means that no goal, try or horse’s whisker past the post is missed, and no one ruins your carpet with dirty shoes or spilt tomato sauce. You’ll need to be careful when selecting and installing your TV to make sure it will resist heat and water and is placed away from the elements. There’s not much better than outdoor entertaining and hosting (or attending) a Spring BBQ. By getting on top of the trends for this season, you’ll be throwing a winning Saturday arvo BBQ, or a beautiful warm night with close friends and family. Inspired to rejuvenate your outdoor space? Take a look at our verandah and pergola designs and contact us for a FREE measure and quote. 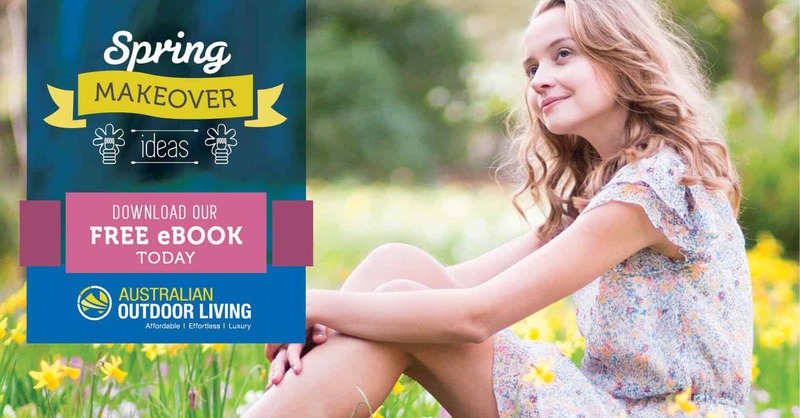 For more backyard trends and ideas for spring, read our 27 page Spring Makeover eBook, chock full of great DIY, design and activity ideas.